Sandals Barbados, an all-new retreat in the spirited St. Lawrence Gap area, offers undeniable luxury with inventive accommodations spanning three unique villages, world-class cuisine with international appeal, including a festive Indian cuisine restaurant, and innovative bar and pool designs. Unwind to the relaxed calypso beat, enjoy the sun and surf and explore your suite, an abode designed with your utmost comfort in mind and featuring everything from ocean views, Butler Elite service and zero-entry access to Barbados largest and longest lagoon pool, to private tranquillity soaking tubs on most patios and terraces. Sandals Luxury Included® All Inclusive offers guests all meals, snacks and unlimited premium brand drinks including a selection of wines by Robert Mondavi, Red Lane® Fitness centre, non-motorised water sports including kayaking, Hobie Cat sailing, body-boarding and windsurfing, unlimited scuba diving for PADI certified divers and nightly entertainment. 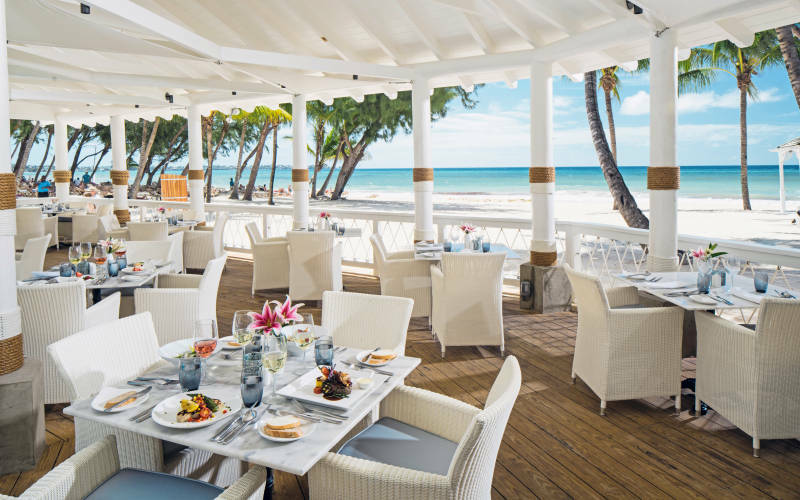 If you are looking for a romantic setting, fantastic dining and a host of activities, then Sandals Barbados ticks all the boxes. 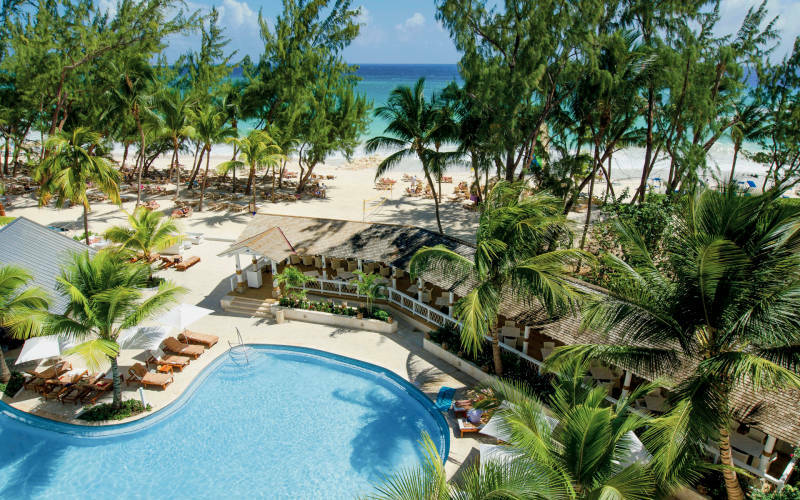 Adult only Sandals Resorts are ever popular with honeymooners and couples seeing romance, relaxation and rejuvenation. 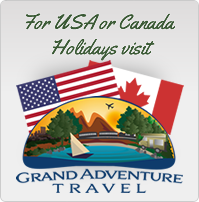 Also, with various fantastic special offers available virtually year round, there is always a great holiday deal to be had. On Dover Beach, just a 5 minute walk from bustling St Lawrence Gap. The transfer time is approx. 15 minutes from the airport and Bridgetown. 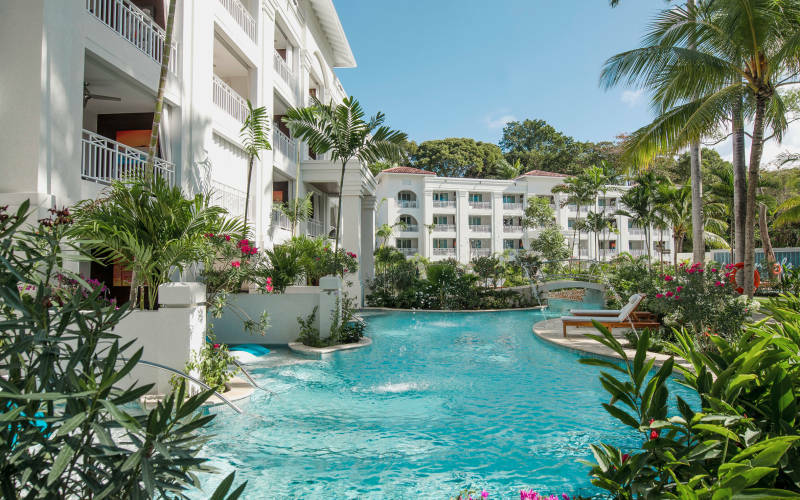 The Caribbean Village – Nestled in tropical gardens. The Crystal Lagoon Village Overlooking the sparkling lagoon. The Beachfront Village – Offers sea views with the option to upgrade to an opulent Beachfront One Bedroom Butler Suite with Balcony Tranquillity Soaking Tub which boasts exquisite views over the turquoise sea. The rooms themselves, are categorised into four different ‘themes’ each encompassing luxury yet with a unique focus. Love Nest Suites – Defined by exclusive amenities and unique designs, these luxurious suites and villas create the ultimate escape for lovebirds. These well-appointed suites feature lavish bathrooms and amenities such as plush terry robes, hand-embroidered Egyptian cotton duvets, HD smart TVs, and the attentive service of a personal butler. Butler Level – Butler-class accommodations offer all that you would expect in a well-staffed grand home with every amenity imaginable. Over-the-top luxurious baths, an en-suite bar stocked with top-shelf liquors and wines, and the most indulgent bedding that inspires your best nights sleep ever. Everything feels better, tastes better, and creates the most endearing of memories when luxury is priority one. 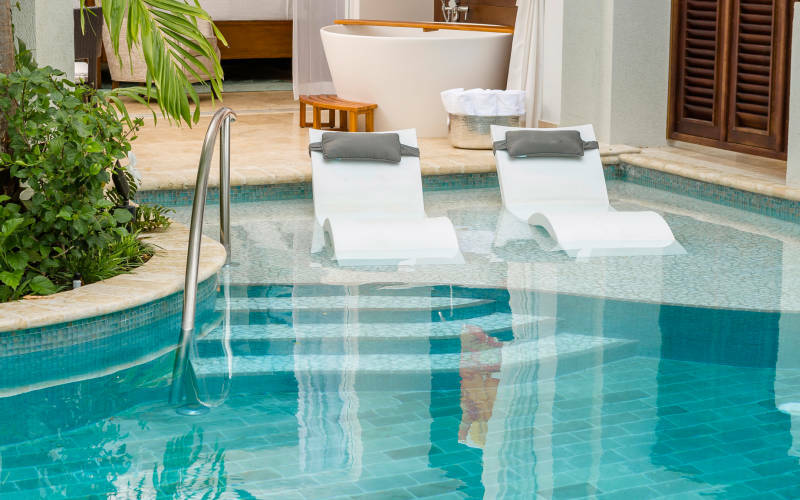 Luxury Room – Luxury personified – that’s what you can expect when you indulge in a Sandals Luxury All Inclusive vacation. Even our basic rooms offer luxurious furnishings, highest quality linens and fine in-room amenities. At Sandals you are always immersed in utmost privilege and distinction in your own private sanctuary. Select alcoholic beverages, sparkling wine, fruit juices, soft drinks and water, Concierge signature drink, all day snacks and pastries, biscuits, Jamaican desserts and a range of fruit, morning Danish pastries, muffins and banana bread, mid-afternoon sandwiches and wraps and afternoon tea. There is a flat-screen television, a selection of board games, coffee machines serving fresh ground espressos and cappuccinos, Kindles to use in the lounge. Library and free internet access, plus, exclusive weekly hosted events include a cocktail party, wine tasting from the managers wine list, a martini evening and snorkelling. Guests will be offered assistance with planning their stay, will be presented with a weekly planner, helped with dinner, spa, tour and private dinner bookings and, if required, will have daily contact with staff throughout your stay. Other benefits include: Robes in all rooms, a daily restocked fridge with selected alcoholic drinks, water and soft drinks and personalised Island Routes Club Sandals Tours. With 11 gourmet dining experiences there is something to suit every mood and occasion. Discover diverse cuisines from around the world, including Sandals first Indian restaurant, teppanyaki-style dishes at Kimonos, juicy steaks at Butch’s Chophouse and indulgent desserts at Cafe de Paris, a Parisian-style patisserie. You can also enjoy regular theme nights and weekly events including a beach party and Caribbean night. Stay cool in the day while sipping cocktails at the swim-up bar and enjoy a premium brand drink in the evening while watching the flickering flames of one of the romantic fire pits. The Bayside – Offers an international buffet breakfast and lunch. 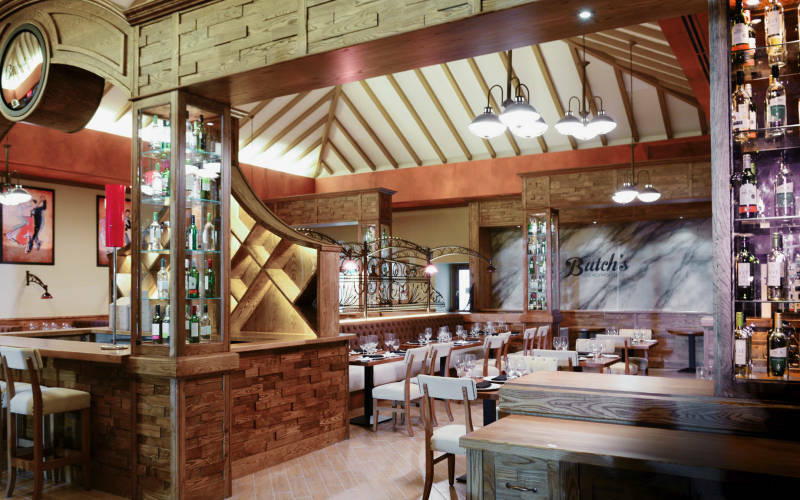 Butch’s Chop House – An upscale New York steak house. The Mariner Seaside Grill – Offers a casual setting for grilled dishes. Bombay Club – Sandals first Indian restaurant. Cafe de Paris – A French patisserie serving speciality coffees and French crepes. Dino’s Pizzeria – Offers traditional brick oven-baked Neapolitan pizzas. Kimonos – serves Japanese teppanyaki. The Merry Monkey – is a British gastro-pub. Portofino – offers tasty Italian cuisine from the Liguria region. Schooners – serves fresh seafood. Soy – is a sushi bar. The Chocolate Buffet – offers tempting sweet treats once a week. Doggies Hot Dog Stand – open 12-3 five days a week. Paddle boarding, kayaking, sailing and windsurfing, catamaran cruise (charge applies) beach volleyball, “Tropical Paradise” massage on the beach (charge applies) and explore Bridgetown during a historic walking tour.